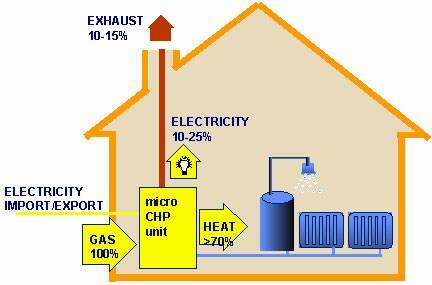 Micro CHP (Combined Heat & Power) replaces the gas boiler in a central heating system. It burns gas to produce space & water heating, whilst simultaneously generating around 3000kWh of electricity annually. Effectively each unit of electricity “costs” a unit of heat that would otherwise have been produced in the boiler, saving money and carbon. Micro CHP is defined by the UK Government as being CHP with an electrical output less than 50kWe; this clearly includes units far too big for individual homes for which products up to 3kWe and normally around the 1kWe level are most common. This section deals only with domestic micro CHP, suitable for individual family homes; products from 5-50kWe are dealt with under mini CHP. There are a number of micro CHP technologies, each of which offers benefits in different applications. They are normally categorised by the "prime mover", that is the engine or other device which produces heat and power from the input fuel. Technologies currently in use or approaching market readiness include engines (Stirling, Rankine and Internal Combustion), which burn fuel in the engine to drive a generator and produce heat, and fuel cells which convert gas directly into heat and electricity through an electro-chemical process. The economics of micro CHP depend primarily on the generation of electricity; electricity is significantly more valuable than heat both in economic and carbon terms. Thus, in order to maximise the value of this generation, it is desirable to run the system for as many hours per year as possible, so that products with high electrical efficiency (and relatively low heat output) are desirable. However, it is also important that the cost of the product does not result in extended payback periods; typically around 3-5 years is considered viable and micro CHP is unique amongst microgeneration technologies in being able to achieve paybacks this short. The principal challenge for any micro CHP technology is to operate for sufficient hours to recover the investment. Target life for micro CHP is around 30,000 hours, representing 10 years operation in a typical family home. This is an extremely onerous challenge and is the main technical obstacle to most products. Bear in mind that a normal car engine requires a service every 200 hours or so and is unlikely to last more than 2,000-3,000 hours in total! For more information on micro CHP products visit the micro CHP website.